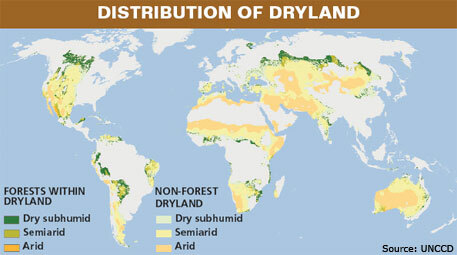 FOR 38 per cent of the world’s population that lives in dryland, the threats of desertification due to overexploitation of resources and global warming are always near. Climate change models predict an increase of 4°C in average annual temperature in dryland areas by the end of 21st century. This would reduce the ability of ecosystems to perform functions like recycling of carbon, nitrogen and phosphorus. This in turn would affect soil fertility and food production. Now a study for the first time has provided evidence that preserving biodiversity of plants could buffer negative effects of climate change in dryland. It is known that loss of biodiversity impairs functioning of ecosystems. These include provision of water and food; regulating services such as carbon sequestration and waste decomposition; and supporting services such as nutrient recycling. While these functions have been studied in isolation earlier, the links between biodiversity and multi-functionality have never been assessed. Researchers did an empirical study of the links between biodiversity and multi-functionality in the drylands which account for 41 per cent of the land surface across the globe. The study by Fernando Maestre, biologist with Universidad Rey Juan Carlos in Spain and colleagues from 14 countries, was carried out in dryland areas spread around Argentina, Australia, Brazil, Chile, China, Ecuador, Iran, Israel, Kenya, Mexico, Morocco, Peru, Spain, Tunisia, US and Venezuela. Between 2006 and 2010, the team collected soil samples from 224 plots. These plots represented the main ecological features at each site. The soil samples were studied to assess 14 functions related to recycling and storage of carbon, nitrogen and phosphorus which are indicators of soil fertility and climate regulation and are used to identify the onset of desertification processes and correlated them with the presence of perennial plants. The results indicated that biodiversity was an important attribute for the ecosystems studied, helping the soil maintain its multiple functions. Richness of perennial plants was more strongly tied to critical ecosystem services than other factors, such as annual rainfall or microbes in the soil. “Overall we found that sites with low species richness, higher annual mean temperatures and sandy soils had lower multifunctionality and were at higher risk of losing ecosystem functionality,” says Maestre. These places should immediately take actions to protect their biodiversity, he suggests. Land degradation is often accompanied by loss of soil fertility. Plants would promote ecosystem resistance to desertification, says co-author David Eldridge from Australia. The study was published in the January 13 issue of Science. In a commentary on the study, Guy Midgley from South African National Biodiversity Institute in Cape Town notes the relationship between biodiversity and ecosystem function is important because socio-economic development is always accompanied by loss of natural habitat and species. He adds that erosion of biodiversity at local scales may reduce the resilience at larger spatial scales. So would the study help protect the environment? “Only if it influences land management, land use, and land conversion in the areas which are experiencing substantial degradation. If the study had shown that biodiversity did not matter, then people would do little to protect native diversity and focus on other issues, such as erosion, fires, or invasive species,” says Shahid Naeem, ecologist with Department of Ecology, Evolution, and Environmental Biology, Columbia University, US. Plants are the key to biodiversity, they help stabilize climate by improving soils and ecosystem resilience. Biodiversity must be protected in order to avoid climate change. The trick will be to make biodiversity commercially successful. Private equity funds for biodiversity can fulfill a key function in identifying winning ideas to support communities, foster clean and ethical biotrade and improve soil and climate.